Please let me know the stone choice(s) here, if any. (Otherwise say none.) Refer to the photos as a guide to the stones I offer. Dharlee presents an initial pin with a script style initial to be worn on a coat, sweater, or lapel. This pin measures roughly about an inch, a bit more for some letters. 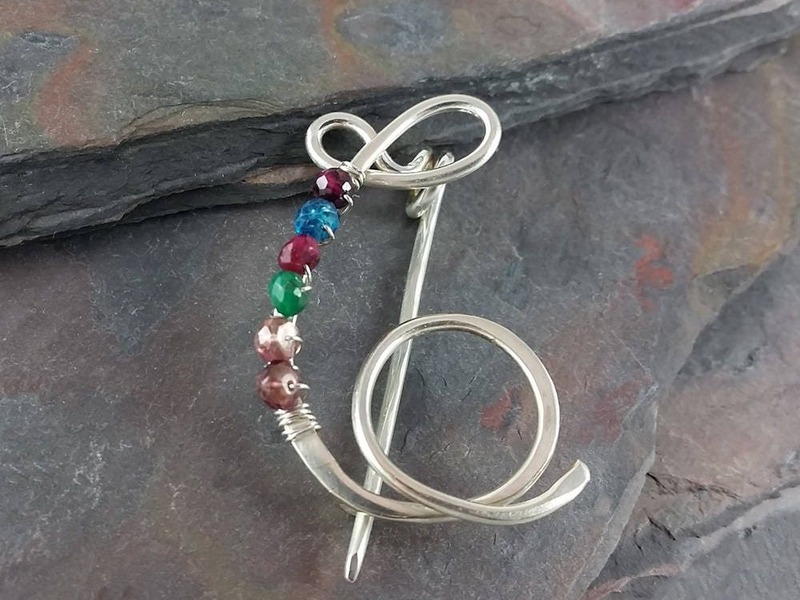 I can add birthstones to this pin if you would like to have them. I can add up to 6 genuine gemstones depending on the letter chosen, however I might be able to add more if you need them. Please see the other photos for an example. If you want more than 6 birthstones please ask and I can tell you if it can be done and the price. If you want gemstones, please let me know the gemstones you want from the selection shown in one of the photos. PLEASE NOTE: Opal and Diamond are NOT a choice and will not be used. If you ask for Opal, Pink Tourmaline will be used. If you ask for Diamond, White Topaz will be used. This piece is made from beautiful thick sterling silver and is forged and soldered by me in my home studio. It comes gift boxed. Sterling Silver Family Brooch - Pin - Personalized with up to 12 genuine birthstones.